Carl Baugh and other strict creationists have claimed that in 1912 an electric company employee in Arkansas broke open a large lump of coal, revealing a man-made iron pot. 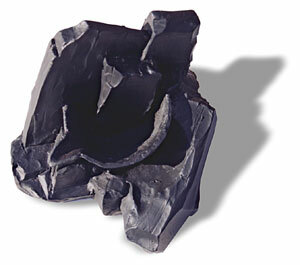 The original coal bed was reportedly mid Pennsylvanian age--about 300 million years old by conventional geology. Baugh and others suggest that this finding overturns the standard geologic timetable. The following account is presented on Baugh's Creation Evidence web site, followed by an advertisement encouraging readers to purchase a cast replica of the pot and nodule, which he describes as 5.5" wide x 6.5" long x 4.75" tall. of the coal, and found that it came from the Wilburton, Oklahoma Mines. Sworn to before me, in Sulphru [sic] Springs, Arkansas, this 27th day of November, 1948. Jullia L. Eldred N.P. My commission expires May 21, 1951 - Benton Co.
One problem with this kind of evidence is that it relies heavily on the veracity and memories of the individuals involved. Since people commonly lie or are otherwise fallible in this regard, scientifically, anecdotal evidence is not worth much. One might ask why would these men would make up such a story. There might be any number of other reasons--for a gag, attention, etc. However, even if they were telling the truth as far as they knew it, there is an aspect of the report about which they could be mistaken, and on which the significance of the find could rest (which we will get to in a moment). The point is, one cannot make a compelling scientific argument based solely on the word of two individuals. Even the major creationist group Answers in Genesis (AIG) seems to agree with this principle. One of their web articles entitled "Where are all the human fossils" cautions that claims about man-made objects in ancient sediments are not worth much unless accompanied by reliable real-time documentation of the excavation. Noting that past claims of this nature, including other alleged objects in coal, have not met these rigorous criteria, the authors state: "We can only concur that there is no definite unequivocal evidence of human remains in those rock strata that can definitely be identified as Flood sediments." (Batten et al, 2006). In a similar article strict creationist Andrew Snelling writes in Creation Magazine: "As far as we are aware at the present time, there are no indisputable human fossils in the fossil record that we could say belong to the pre-Flood human culture(s)." (Snelling, 1991). As to the aspect of the account which could invalidate it even if the workers were not intentionally lying, let us consider the following. In a mining environment, it is common to find puddles saturated with particles of whatever material was being mined. If a man-made object falls into such a sediment-laden slurry, the sediment will often consolidate around it. Over a period of years this sediment can dry and harden considerably, forming a concretion like structure resembling a piece of the original formation. As noted by Mark Isaac: "The cup appears to be cast iron, and cast iron technology began in the eighteenth century. Its design is much like pots used to hold molten metals and may have been used by a tinsmith, tinker, or person casting bullets... 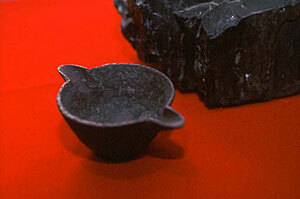 The cup was likely dropped by a worker either inside a coal mine or in a mine's surface workings. Mineralization is common in the coal and surrounding debris of coal mines because rainwater reacts with the newly exposed minerals and produces highly mineralized solutions. Coal, sediments, and rocks are commonly cemented together in just a few years. It could easily appear that a pot cemented in such a concretion could appear superficially as if it were encased in the original coal. Or small pieces of coal, including powder, could have been recompressed around the cup by weight (Isaac, 2005). Thus, a person who broke open such a nodule might mistakenly conclude that it was part of the host formation, rather than a secondary product of the mining environment. This phenomena has been documented with objects as modern as soda bottles and World War II artifacts (Al-Aga, 1995; McKusick and Shinn, 1980), and thus cannot be used as anti-evolutionary evidence. One might object that we do not know that this was the case in regards to the iron pot in question. True, but more importantly, we don't know that it wasn't. In short, even if the workers were telling the truth as far as they knew it, we have no reliable evidence that the pot was actually part of the original coal formation. The following might surprise some readers, but I will take a somewhat more flexible stance than AIG in regards to whether such objects are largely useless without rigorous real-time documentation of an in-situ excavation. While such documentation is important, I will allow that it is theoretically possible to use forensic techniques at a later time to help deduce whether the nodule was ever part of the host formation or not. One method would be to cross-section the nodule and study its composition and microscopic structure to determine whether it more closely matched the original coal bed or that of a hardened secondary slurry. One would have to be very careful in such a study, since as noted by Isaac, it is possible that chunks of the original host formation might be cemented into the nodule along with smaller sediment particles. However, to my knowledge such work was not conducted on the specimen in question. Baugh's web site sells cast replicas of the pot and nodule, but he does not say where the originals are, or whether the mold used to make the casts was made directly from the originals or merely sculptures of them. Assuming the originals still exists and can be verified as the objects in question, this work might still be done. The same goes for similar alleged anomalies, such as Baugh's "London Artifact" (an iron hammer in a supposedly "Cretaceous" rock nodule). However, without careful forensic work of this nature, and lacking reliable in-situ documentation, such objects remain curiosities at best, and not reliable out-of-place artifacts. Al-Aga, M. R., S. D. Burley, C. D. Curtis, J. Eason, 1995, J. Geol. Soc. London, 252, 157. McKusick, M. and E. A. Shinn. 1980. "Bahamian Atlantis Reconsidered." Nature, Vol. 287, September 4, pp. 11-12. Snelling, Andrew, 1991 (Dec). Where are all the human fossils? Creation 14(1):28-33.